Many people would probably agree to me that it is during college when someone finds the most ideal environment for friendship. Well, at least for me, it was during college when I found my closest and best friends today. Back then, the names Franco, Joey, Marichu, Christian, Paul, Elmer, Redan, Jowalsh, Josephine, and Rey Al were merely students with a hi–hello relationship and by chance were able to meet and knew each other. Rey Al is my twin brother. 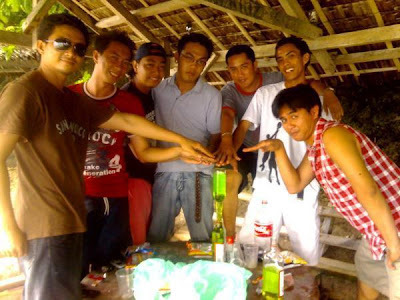 At first, we started hanging out as drinking buddies for sprees and night outs. As days and weeks gone by, our relationship became intimate. We learned how to appreciate each other, enjoy each other, and became available for anyone who needs us and our help. The relationship was no longer for mere fun and excitement but also for support, reliance, care, trust, and love. We became so close. We became friends. We had sad and happy moments. There were fights and squaring off. Despite our individual differences, we were and until this very day the best of friends. In our society, we are expected to wear our public faces and proper characters, but, with these friends, I can always be comfortable with who and what I really am. We are all safe with each other to show our real selves, no matter how idiosyncratic we are. As we get along, we found new friends and the coterie we started got larger. To name some, Jico, Mark and his girlfriend Shasha were added. Years have already passed and we all have graduated from our chosen specializations. We have taken different paths. My brother Rey Al now works as a call center agent and happily dating a nice guy. Josephine is now a single mother and with contentment found her dream job of becoming a singer in Thailand. And, can you believe it, all of us are godparents to her son. Joey and Marichu are now engaged and both are working in separate offices. Elmer became an entrepreneur with a meat shop. Christian got married and recently flew off to Canada to be with his lovely wife that sweetens his life – Sugar. Paul is still continuing his studies and currently dating her girlfriend Pinky who in earlier years of our friendship also became one of our closest and important friends. Redan, after years of walking on a rough and rocky plain reached a fertile meadow with lush vegetation and found a lovely Rose he loves and treasures so much. As for Jowalsh and I, we are both still on the journey of finding that one person chosen by heaven and destined for us to love, care, and treasure for the rest of our lives. I presently work as a writer and Jowalsh as a call center agent. Though, some of us are apart – Rey Al in Cebu City, Christian in Canada, Josephine in Thailand – but when we meet, we are still like little children having the best moments of their lives. The laughter, the fun, the excitement are still apparent. When we meet, we still loose ourselves in each other’s company comfortably without malice and prejudices. What future awaits our friendship? No one knows. Nothing is certain. We can only promise to ourselves to remain the best of friends for as long as we all shall live.